Mycoplasma diagnostics is a class of medical tests or examination conducted to evaluate nucleic acids or proteins at a molecular level. This aids in the early detection of mycoplasma contaminations in samples. Mycoplasma diagnostics is considered as a rapidly evolving and fast growing segment in the in-vitro diagnostic industry. Usually, usage of molecular diagnostics was limited due to necessity of vastly skilled specialists and high cost of tests. But decline in cost per sample analysis and labor cost, improvements in automation and introduction of advanced technologies has extended the usage of molecular diagnostics in wide range of applications. The market for mycoplasma diagnostics has expanded since 1990’s with the introduction of PCR. It is estimated that in the U.S. over 600 laboratories and 200 independent laboratories perform mycoplasma diagnostics test to simplify and accelerate the testing process. 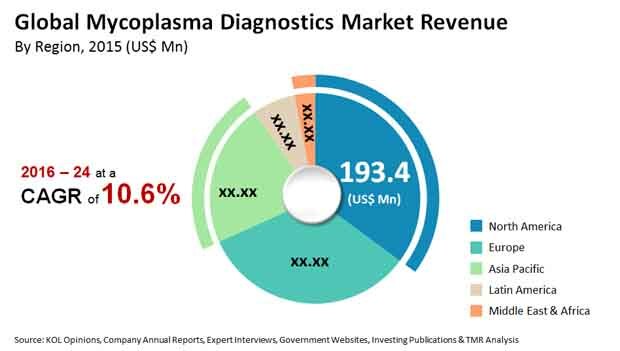 The global mycoplasma diagnostics market, which stood at US$602.0 mn in 2016, is forecast to reach US$1.35 bn by the end of 2024. If these figures hold true, the market will exhibit a CAGR of 10.6% between 2016 and 2024. Based on product, the global mycoplasma diagnostics market can be segmented into kits & reagents, instruments, and software & services. Of these, the kits & reagents segment dominated the market in 2016 and is expected to hold on to its lead through the forecast period. However, growth witnessed in the software & services segment is forecast to be higher in the coming years. The rising demand for automation in pharma, dianostics, and clinical sectors to realize the benefits of cost-effectiveness, will fuel application of mycoplasma diagnostics in these applications. By technology, PCR, immunoassay, DNA staining, microbial culture techniques and others are the key market segments. Currently, the PCR segment contributes the largest share in the revenue generated by the market based on technology. The demand for PCR is forecast to increase considerably in the coming years owing to the rising incidence of hospital acquired infections. The diagnostic technology provides rapid turnaround time, reduction in cost of sequencing, and sensitivity. As end users get to know benefits offered by PCR, the demand from the segment will increase in response. By end users, global mycoplasma diagnostic market is dominated by hospitals & diagnostic laboratories. Hospitals & diagnostic laboratories are an important channel for the usage of multiplexed diagnostic products & offer a range of diagnosis solutions. They are an important channel for the usage of multiplexed diagnostic products. According to the norms of government health care facilities, they offer reimbursement plans and advanced technology systems for treatment. Regionally, North America, Asia Pacific, Europe, Latin America, and the Middle East and Africa constitute the key market segments. Among these regions, North America held dominance in 2016 with an estimated share of 35.4% in the overall market. Several large research laboratories are present in North America. Besides this, the region also boasts a high level of public awareness, which provides an environment conducive to the growth of the mycoplasma diagnostics market. Furthermore, in the coming years, the market is expected to gain from the increasing demand for point of care testing. Despite dominance exercised by the North America market, during the forecast period Asia Pacific will showcase more lucrative opportunities. Besides the high incidence of respiratory tract infection witnessed in the last few years, the emerging nations in the region boasts high healthcare spending, which has helped the mycoplasma market exhibit strong growth in Asia Pacific. In addition, the regional market is forecast to gain from the rising demand for personalized medicines, rise in research and development investments, and the rising public awareness. Key players operating in this market include F. Hoffmann-La Roche Ltd., Agilent Technologies, Sartorius Stedim BioOutsource Limited, Savyon Diagnostics, Takara Bio Inc. (Takara Holding Company Inc.), Lonza Group, Merck KGaA, and Charles River Laboratories International, Inc. among others. The global mycoplasma diagnostics market has been studied based on major product segments, technique segment, their end-users, and regional as well as national markets. Based on product type, the global market has been categorized into three major 4 segments: Kits & reagents, instruments, software’s & services. On the basis of technology the mycoplasma diagnostics market are classified as PCR (Polymerase Chain Reaction), Immunoassay (ELISA, RIA), DNA staining, Microbial Culture Techniques, Others. On the basis of end users the market has been classified as hospitals, diagnostic laboratories, clinics and others.